This page explains the duties of the local authority to provide services and support for children who are currently looked after or have been looked after once they reach the age of 16. The Children Act 1989 places duties on Local Authorities towards ‘looked after’ and previously ‘looked after’ children as they exit the care system. Do I qualify? What am I entitled to? A ‘relevant child’ can include those who have been detained through the criminal justice system, or were in hospital on their 16th birthday. If a ‘relevant child’ has returned home to their parents, they cease to be a relevant child after being at home for 6 months. However, if this arrangement later breaks down before their 18th birthday, they return to being a ‘relevant child’. If a young person has experienced a series of pre-planned respite arrangements, not lasting longer than 4 weeks, each of these will not be considered as qualifying towards ‘relevant child’ status. However, if a young person receives respite care on a regular basis, this may amount to the young person being classed as a ‘relevant child’; the Local Authority’s policy will need to be considered to determine this. If, at the age of 21, the young person is still being helped by the responsible Authority with education or training, then they remain a ‘former relevant child’ until a maximum age of 25. Their programme of education or training will be set out within their Pathway Plan. Former relevant children are no longer dependent upon the Local Authority for income and housing costs. They can obtain benefits in their own right. If they become homeless at the age of 18, 19 or 20, they will automatically be seen as being a priority need. If they become homeless at the age of 21 or over, they will need to be assessed to establish whether they are vulnerable. or the Order remained in force until they reached 18. Can a young person remain with their foster carers beyond the age of 18? The Local Authority also has a duty towards a ‘former relevant child’ if the foster carer and the child agree that the child should remain living with them past the age of 18. This is known as a ‘staying put’ arrangement. The Local Authority has a duty to monitor the arrangement and to provide advice, assistance and support to the ‘former relevant child’, with the view to maintaining the ‘staying put’ arrangement until the care leaver reaches the age of 21. This includes financial support. This duty however will not apply if the Local Authority feels that the ‘staying put’ arrangement is inconsistent with their welfare. This will enable the care leaver to remain in a secure and stable home while they make the transition into adulthood. Every Local Authority should have their own ‘staying put’ arrangements policy. If a care leaver feels their views are not being listened to in relation to a ‘staying put’ arrangement, they should raise this with their Independent Reviewing Officer. How will the needs of a young person be assessed? family relationships (including the need to maintain these). The young person must be fully involved in discussions and plans for their future, and the social worker must also consider the views of any person with Parental Responsibility. The young person must be provided with a written statement containing details of the Needs Assessment such as the expected timetable, the other parties involved in the Assessment and the procedure to follow in the event of disagreement. The Assessment must be completed within 3 months of becoming an ‘eligible child’ or ‘relevant child’. The time runs from the date that Children’s Services were made aware of the young person and not the date that the assessments began. The young person must be fully involved in discussions about their future and plans for their transition to independence and adulthood. What support is there for care leavers? made available to assist in or prepare for adulthood and independent living. Section 3 Children and Social Work Act 2017 requires Local Authorities to provide personal advisors to care leavers up until they reach the age of 25. Statutory guidance on this can be found here. A Personal Advisor acts as a focal point to ensure a care leaver is provided with the correct level of support. There is no prescribed professional qualification required of a Personal Advisor, but they should have a working knowledge of the issues a care leaver might face as they make their transition into adulthood, and the legal framework in relation to this. There are lots of different people who could be a Personal Adviser. It could be that the Local Authority employs a team of people specially to do this job, or a Personal Advisor could be someone already involved in the young person’s care. The young person should have a choice of Personal Advisor and their wishes should be carefully considered. However, the final decision will be made by the Local Authority, which must make sure that whoever it is has the right qualifications and can give the necessary time to support the care leaver properly. keep in touch with the young person. Case law has held that the Personal Advisor should not be involved in the statutory assessment or in preparing the young person’s Pathway Plan. All eligible, relevant and former relevant children should have a Pathway Plan, which will set out the support that will be provided to the care leaver once they have left care. This must be based on the Needs Assessment carried out. The Plan should be prepared before the young person leaves care. The Pathway Plan should set objectives and include how and when these should be achieved. It should be reviewed when a young person requests this and/or the Personal Advisor thinks it is necessary or at least every 6 months. When drafting the Pathway Plan, the Local Authority should have regard to the young person’s views, wishes and feelings, and should provide them with a copy which is understandable to them. They should also consult the parents of the young person’s parents, their current carer, the Independent Reviewing Officer, the Personal Advisor (if already appointed) and an advocate (if the young person has one). Pathway plans should be reviewed every 6 months. However the young person or Personal Advisor can request a review at any time. A review of the Pathway Plan should continue to take place until the young person turns 21 years of age, or beyond if they remain in education. What can I do if I am unhappy with the assessment process or support provided? If you are a young person and you feel that the assessment has not been properly followed, you can submit a complaint to the Local Authority . The Local Authority should inform you how to do this. It is advisable that you have an advocate to help you, please see our information page on Advocacy for further information. Coram Voice has produced a resource to guide children in care and leaving care in making a complaint which can be accessed here. If there is a clear failure to follow the regulations, it is possible to bring a Judicial Review against the Local Authority – we advise you to contact a solicitor. The young person is entitled to make a complaint about the way they have been assessed or the support listed in the Pathway Plan. Have you been in care for at least 13 weeks since you were 14 (even if not continuous)? Are you still in care? Were you in care on or after your 16th Birthday? 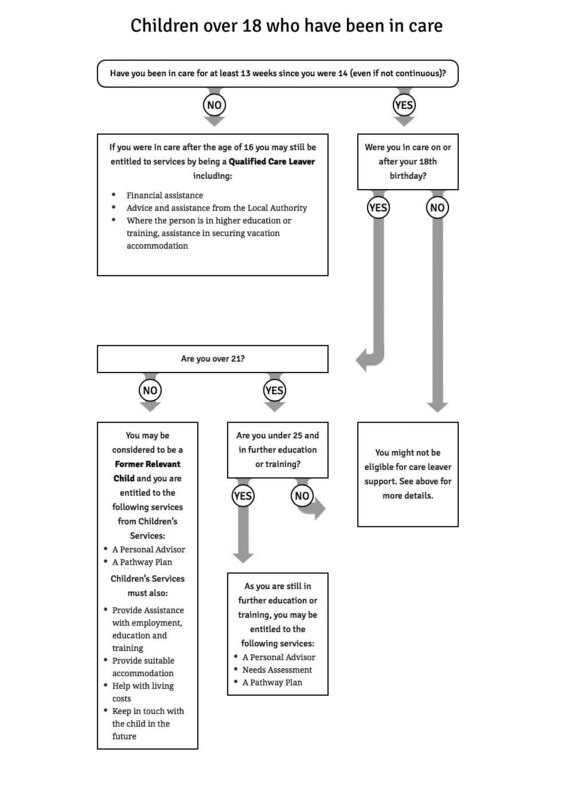 You might not be eligible for care leaver support. See above for more details. 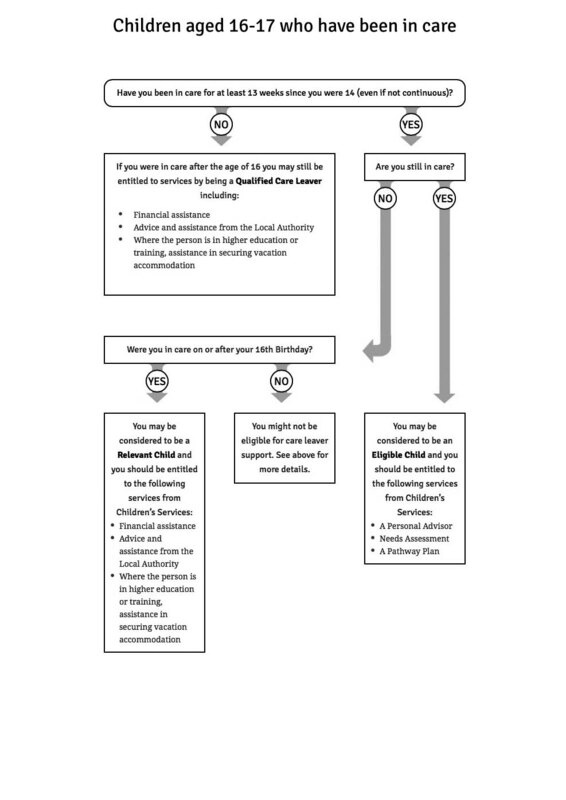 Were you in care on or after your 18th birthday? Are you under 25 and in further education or training? This information is correct at the time of writing (Feb 13, 2019 @ 11:52 am). The law in this area is subject to change. Coram Children’s Legal Centre cannot be held responsible if changes to the law outdate this publication. Individuals may print or photocopy information in CCLC publications for their personal use. Professionals, organisations and institutions must obtain permission from the CCLC to print or photocopy our publications in full or in part.